Welcome to our B&B in Windermere, the Hawksmoor Guest House. Whether you simply want to relax, visit Beatrix Potters 'Hill Top' or put on your boots and walk the fells like Wainwright you'll discover the best of both worlds at the Hawksmoor. 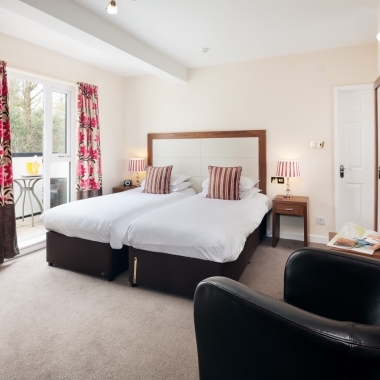 We pride ourselves on being one of Windermere's premier guest houses and focus on providing a high quality level of service and accommodation as standard. Like any good guest house we aim to make your stay not only pleasant and relaxing but perfect for you. We would like to thank you for visiting our site and hope to welcome you to the Hawksmoor Lakeland Guesthouse in the near future. If you have any questions or queries about the guest house or things to do in and around Windermere and the Lake District during your visit then please feel free to get in touch with us. We'll be happy to provide you with further information about our facilities in our B&B in Windermere. 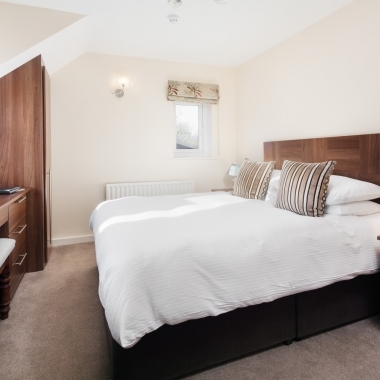 A ground floor Larger Room with 6 ft Super king double or Twin beds, Fridge, Bath / Shower en-suite. Balcony with a woodland view. 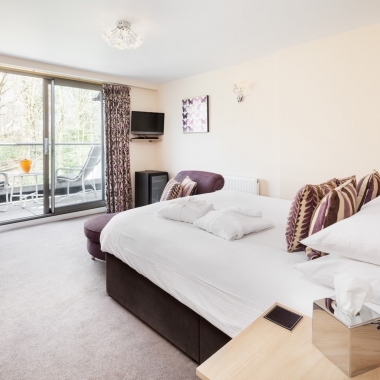 A first floor Luxury double room with a 5 ft King size double bed and a Balcony overlooking the Woods behind, a fridge and robes supplied. The en-suite has a Bath with LCD flat screen Television and Separate Shower. A first floor smaller single room with 5 ft King size double bed, bath only en-suite, hairdressing shower and views of the garden. "Home from Home and a bit more!" Plenty of room to keep your car safe. But most importantly we have never been somewhere that the owners made us feel so welcome and left us to do as we pleased at the same time, which is a hard act to balance.